No game stirs childhood memories for me as much as Space Invaders. Having wasted many hours during the late 70s pouring coins into the Space Invaders machine in the fast food place down the road, I would go to sleep with pixellated aliens marching relentlessly across my vision. The original Space Invaders has inspired hundreds of similar arcade games over the years (not to mention Human Space Invaders!). The original Space Invaders publishers, TAITO, have released a couple of versions for the iPhone: Space Invaders (a clone of the original) and the marvellous Space Invaders Infinity Gene. This game isn’t just Space Invaders with a few extra bells and whistles – it’s a complete rethink of the game. Putting aside the fact that it’s based on one of the classic arcade games of all time, Space Invaders Infinity Gene is one of the best arcade shooters on the iPhone that I’ve ever played. The game starts much like the original game, but quickly evolves into a much more fast-paced affair, with all sorts of baddies zooming over the screen. 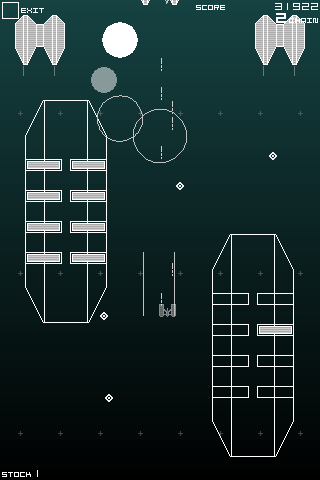 You also get to move your ship up and down as well as the usual left and right (now there’s progress!). It can get quite hectic at times, but fortunately you can move the ship by touching anywhere on the screen, so your finger doesn’t get in the way. You don’t have to worry about shooting either, as the ship auto-fires constantly. Hmm… not a great day for my iPhone last week. Its wi-fi was playing up so I decided to power cycle it. After switching on it hung on the Apple logo for 4-5 minutes. Power cycled again – same problem. Sounds like a common issue. Here are some helpful suggestions for fixing it. Anyway I was lucky – I connected the iPhone to the Mac (with iTunes running) and, after a couple more restarts, the iPhone booted successfully. I say “successfully” in that it got to the Home screen. But then every third-party app I tried to launch quit immediately back to the Home screen! (Apple apps were OK.) Once again, this sounds like a common problem. Ouch. In my case I managed to fix it by connecting the iPhone to the Mac, running iTunes, right-clicking the iPhone in the left-hand pane and choosing Restore from Backup. It took ages and hung right near the end (I had to yank the USB cable out of the phone to stop it), but after that all apps launched no problem. If you’re reading this because you have this problem, and the above solution doesn’t work for you, you may need to do a full system restore (as described in the linked discussion thread above). You are currently browsing the Reality Distortion: Macs, Mac OS X, and Apple stuff weblog archives for August, 2009.